One of the keys to this book and Bresson himself is the fifth aphorism: “Metteur-en-scène, director. The point is not to direct someone, but direct oneself.” It’s a tart recrimination, less Zen-like than many that follow, but it’s pointedness portrays cinema’s great hermit. First the French term, coined by André Bazin, literally means, “scene-setter,” or “placer of the scene.” But it also connotes that the director’s unique aesthetic style is visible in her scenes. Bresson’s thoughts are very eastern and turn the world on it’s head. Here are two favorites. I had to read this a few times to trick my mind out and make it meaningful. 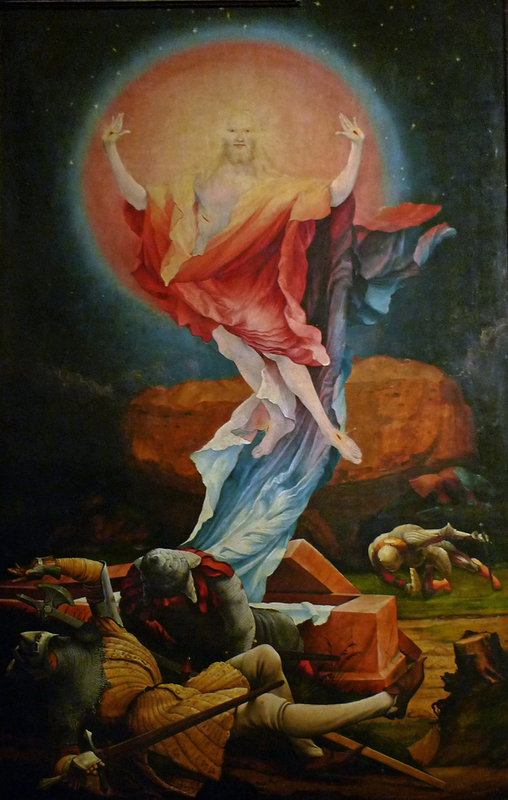 In Grünewald’s panel ‘The Resurrection” from the Issenheim Altarpiece (1515) one can see how this is true. The colors, the glow of the resurrected Christ, the tumbling, earthbound soldiers showing how awesome Christ’s power is. Accounts in the Bible are one thing, but this scene (arguably the most amazing event in human history, a man coming back from the dead) has been portrayed tens of thousands, maybe millions of time in paint. No wonder painters were so important to the church. *The other day I was walking through the gardens by Notre-Dame and saw approaching a man whose eyes caught something behind me, which I could not see: at once they lit up. If, at the same time as I saw the man, I had perceived the young woman and the child towards whom he now began running, that happy face of his would not have struck me so; indeed I might not have noticed it. This Chaplinesque anecdote says a few things at the same time, not the least being about human loneliness. These notes are for any artist, no matter the medium. In lieu of a mentor they are artistic lessons that are priceless. In lieu of nothing they are everything.